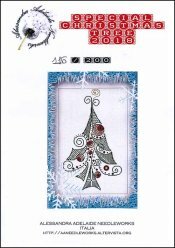 Special Xmas Tree 2018 [H5397] - $14.08 : Yarn Tree, Your wholesale source for cross stitch supplies. Cross stitch pattern by Alessandra Adelaide Needleworks. Filled with patterns, swirls & dots, this whimsical Christmas tree is a fun addition to your holiday decor! This design is a limited edition! Stitch count is 110 x 191.